This unusual name is an English double diminutive form of the Norman personal name 'Hamo(n)', introduced into England after the conquest of 1066. The personal name derives from the Germanic 'Haimo', which is a short form of various compound names with the first element 'haim', meaning 'home'. In the Domesday Book of 1086 three variant forms of the personal name are recorded. 'Hamo', 'Haimo', and 'Hamon'. 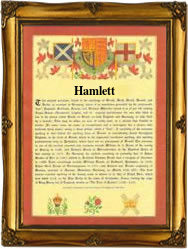 The modern surnames Hamlet, Hamlett and Hamblett are formed of the shortened name 'Ham' with the double diminutive 'el - ot'. As a personal name, 'Hamlet' was in use until at least the mid 16th Century, as in the recording of the will of one Hamlet Milot of Carrigton, at Chester in 1587. Elizabeth Hamlet was married to William Tirrat on the 13th March 1647 at St. Bartholomew the Less, London. The first recorded spelling of the family name is shown to be that of Judith Hamlet, christened, which was dated 4th December 1553, at St. Peter Cornhill, London, during the reign of Queen Mary, known as 'Bloody Mary', 1553 - 1558. Surnames became necessary when governments introduced personal taxation. In England this was known as Poll Tax. Throughout the centuries, surnames in every country have continued to "develop" often leading to astonishing variants of the original spelling.